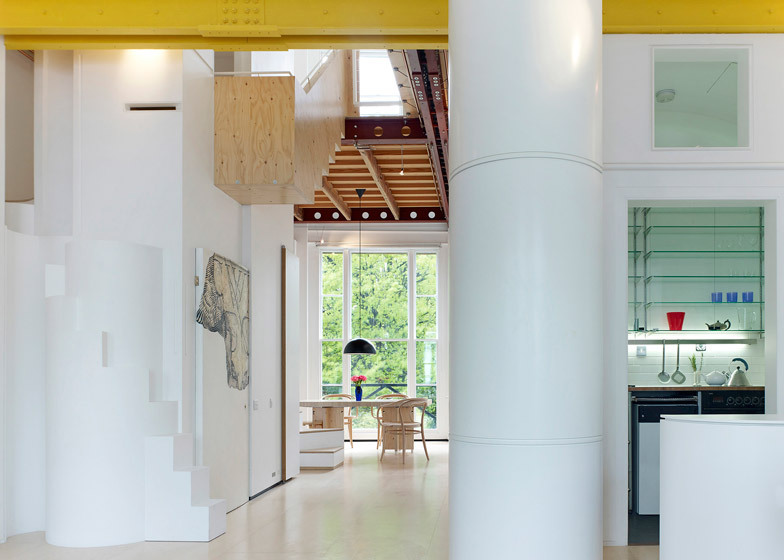 A wooden staircase cantilevers over the central atrium that architect Andrew Pilkington has cut through the first floor of a Victorian building in west London to transform two small apartments into one large residence (+ slideshow). 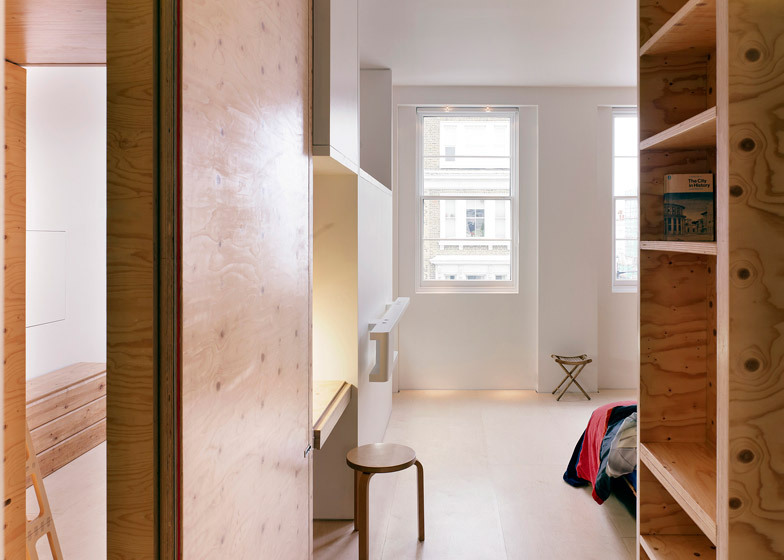 London-based Andrew Pilkington merged the first and second floor of an end-of-terrace block to create 3floor-in2 Apartment, a 120-square-metre residence over two full floors and a partial mezzanine level, in Notting Hill, west London. 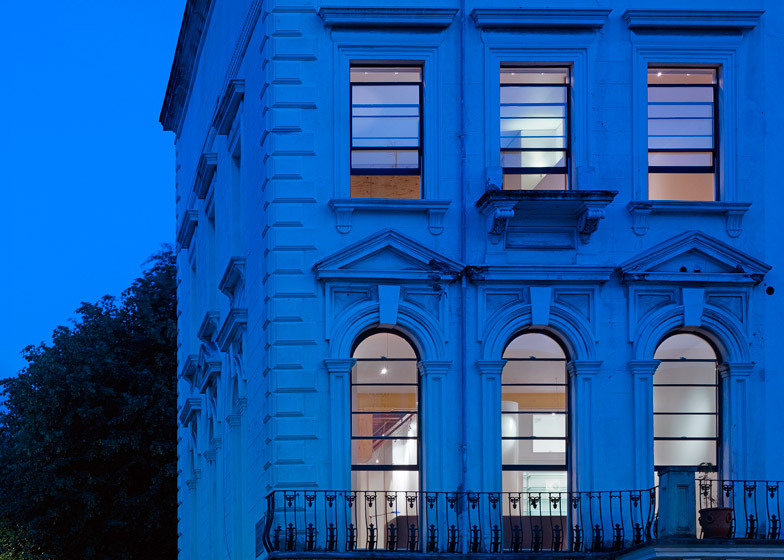 The project unites two previously separate residences in the building, creating an apartment with an open-plan living and dining area on the lower floor, and two bedrooms and a study above. 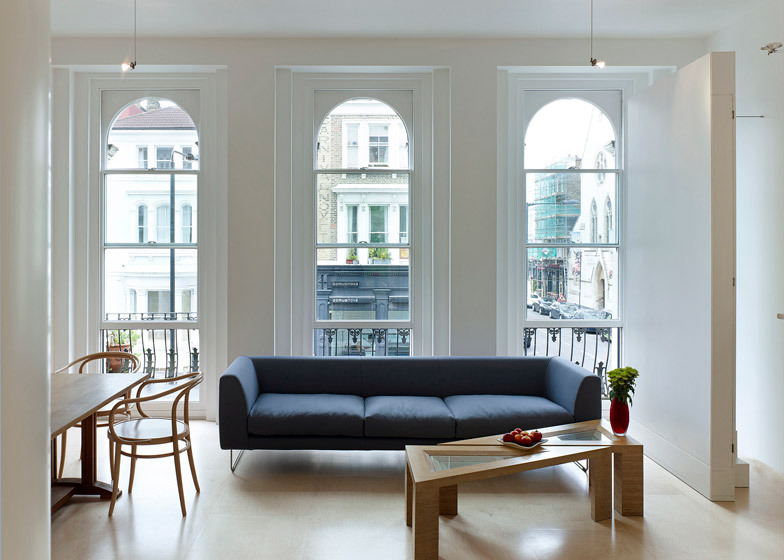 The architect retained the exterior shell of the Victorian property and a number of the apartments' original features, including arched window frames and doors. He combined these with contemporary white-washed interiors, exposed woodwork and primary-coloured accents. "Fundamentally this project demonstrates that it is possible to respect and celebrate the good bones of traditional spaces while creating rooms with an innovative forward focus," Pilkington told Dezeen. 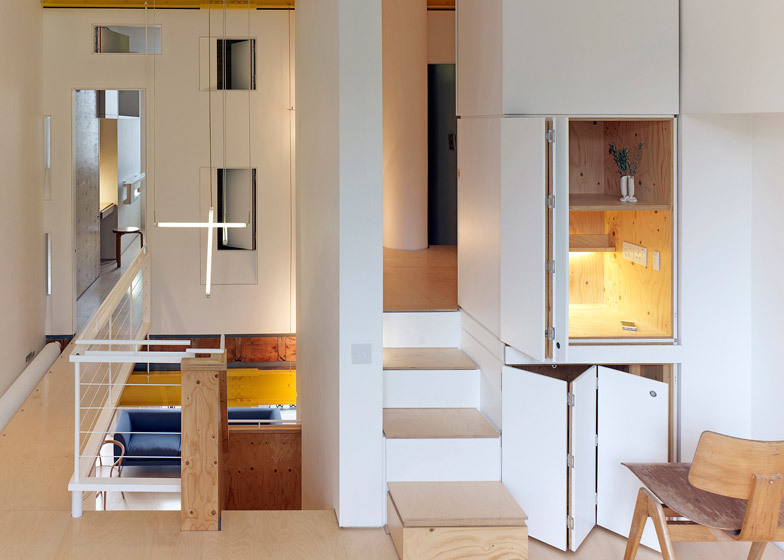 To create an interior connection between the two apartments, the architect inserted the new atrium at the centre of the plan, providing a staircase that connects the two floors and a small mezzanine level. "To unite two flats over two floors as one apartment they must feel in no way like two joined flats," said the architect. Entrance to the apartment is via a communal doorway and staircase that also provides residents on the upper floors with access to their properties. 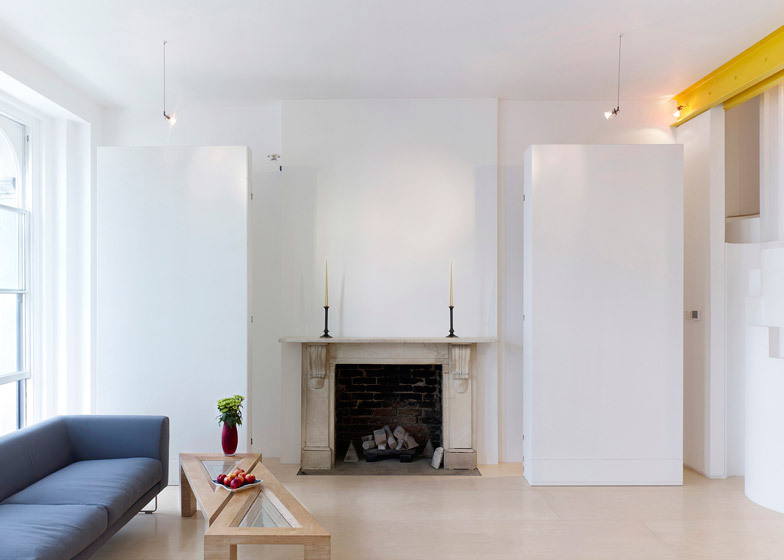 The front door opens from the staircase into the atrium and an adjoining dining room, while an open-plan living room and kitchen look onto communal gardens at the rear of the property. A narrow set of steps with white edges and wooden treads faces the doorway, leading up to the bedroom level and mezzanine beyond. 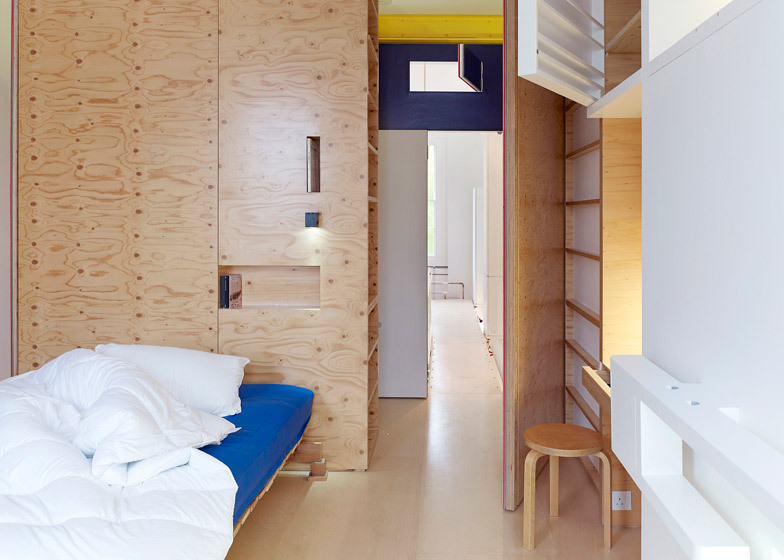 "The interior staircase of edge-revealed plywood starts as white squared boxes, then passes up connecting the interior levels through a series of differently figured spaces," said the architect. 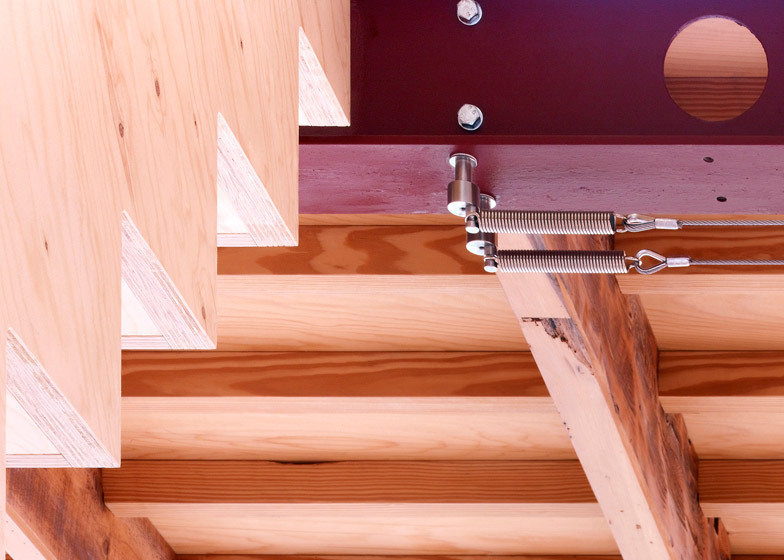 Primary-coloured I-beams support a coffered wooden ceiling – the underside of the wooden-floored upper level. 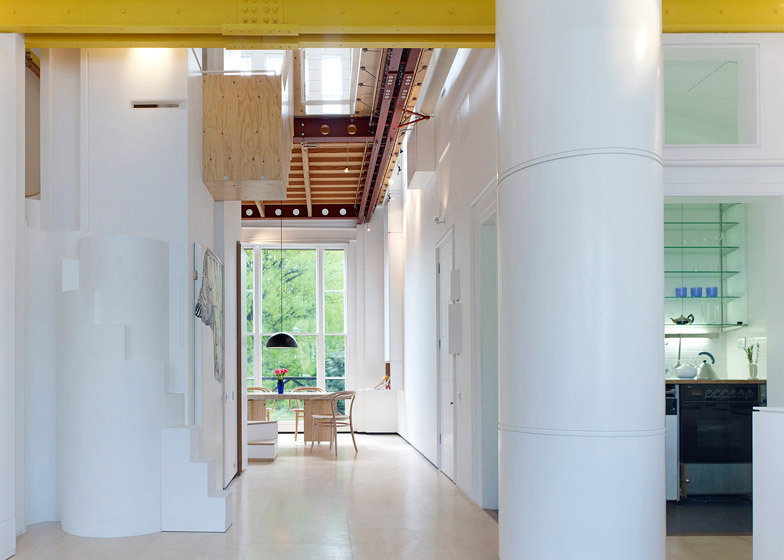 The steel beams are painted in shades of yellow and red that contrast with the pale interior decoration of the lower floor. The stairs break at a landing between the two storeys, offering residents a place to survey the open-plan sitting and dining area below. Where the stairs continue to the first floor, they cantilever over the space below. 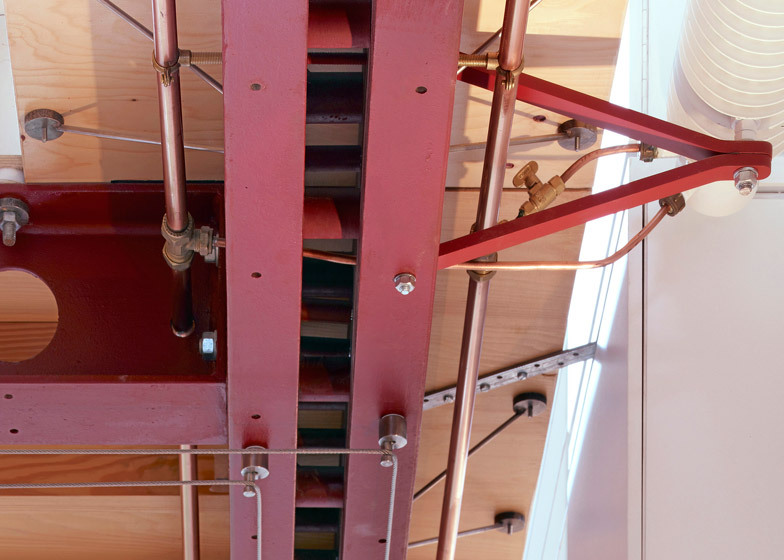 This section of the wooden staircase is bracketed to the underside of the steel supports with large metal bolts. 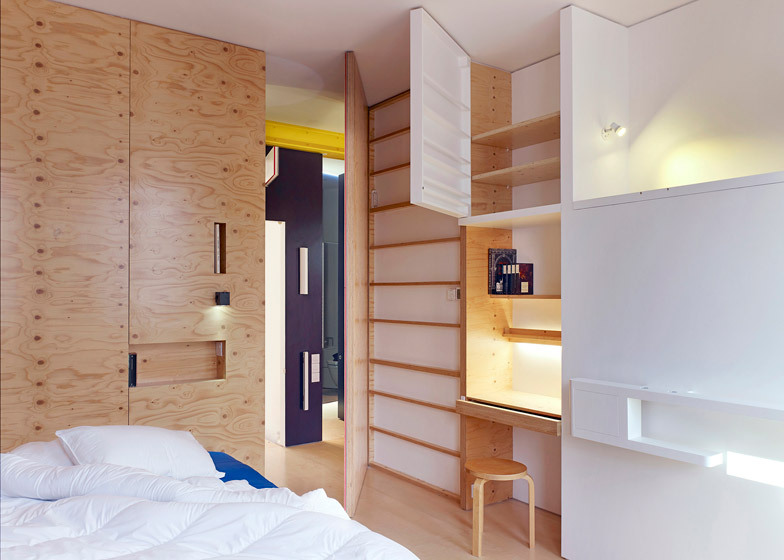 "It's a mix of a minimal aesthetic with industrial touches," said Pilkington. 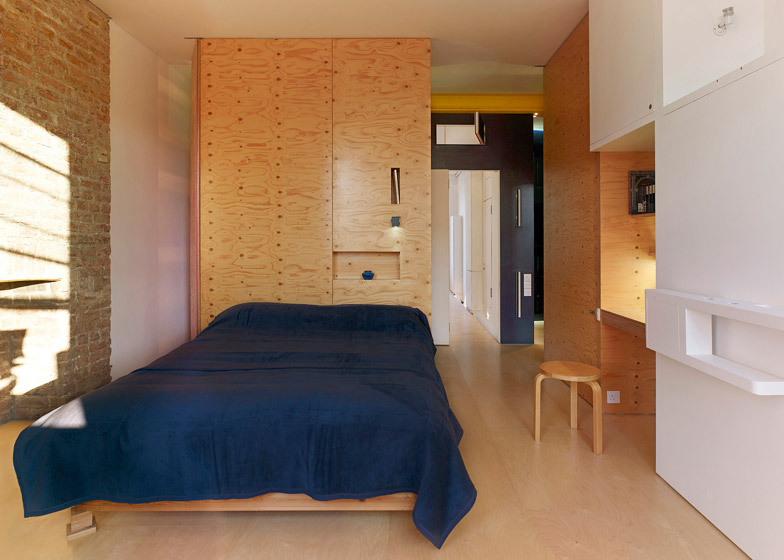 The first-floor study features storage cupboards with concertina doors built into the walls. A bridge across the atrium leads through to a bathroom and two bedrooms overlooking the garden. In the bathroom, a white spiral-shaped "nautilus" shower-cubicle constructed from a curled sheet of polypropylene echoes curved elements on the ground floor of the property. Hatches cut into the navy blue walls of the bathroom and hallway open onto the stairwell, providing natural light for these areas that have no exterior windows. Three crisscrossing light tubes hang from the ceiling over the stairwell, providing additional lighting and a focal point above the atrium. At the end of the hallway, a small flight of ply steps lead up to a wood-lined annex on the third-level mezzanine and back down into the study.